The MODEL 500 is the new revolver from SMITH&WESSON. It was mainly engineered as an hunting weapon, modifying a "traditional" X-Frame revolver for the powerful, proprietary-made .500-S&W Magnum, a cartridge with a 2600 ft/lb muzzle energy which ensures this weapon to be the most powerful revolver currently on the market and to be an excellent game weapon for any kind of walking animal. The heavy recoil of the Model 500 revolver is tamed by an effective muzzle compensator, plus by the recoil absorbing grippings made in a material called Sorbathane, by HOGUE. It is made in stainless steel, with satin stainless finish, interchangeable black blade front sight and micrometer click black blade rear sight. It features an internal lock as a safety measure, and works in SA/DA. The Smith&Wesson PERFORMANCE CENTER enhanced this already excellent weapon creating the MODEL 500 MAGNUM HUNTER, which bears some differences from the "standard" MODEL 500, including the possibility to fit a sling, an upper, integral weaver rail for easy optics mounting (although it already come standard with an orange dovetail ramp front sight and an adjustable white outline rear sight), a longer barrel which increases velocity and energy of the bullet, equipped with a recoil compensator for increased muzzle control, a tuned performance center action, flash cromed hammer and trigger, a HOGUE-made dual density monogrip, and glassbead finish. 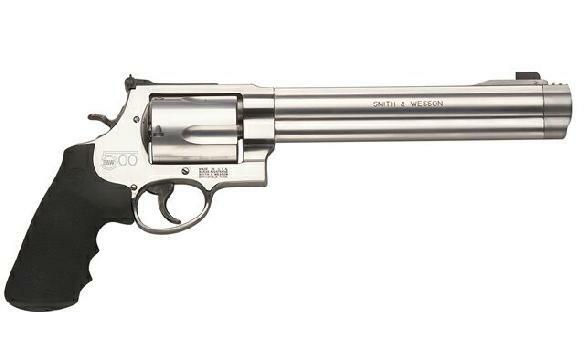 The suggested retail price for the SMITH&WESSON MODEL 500 revolver is US$ 987. --- TECHNICAL SPECS: =MODEL 500= CALIBER: .500 S&W Magnum CAPACITY: 5 rounds BARREL LENGHT: 8-3/8" TOTAL LENGHT: 15" WEIGHT: 72,5 Oz. RIFLING: 6 Grooves, RH.